Call to Action No. 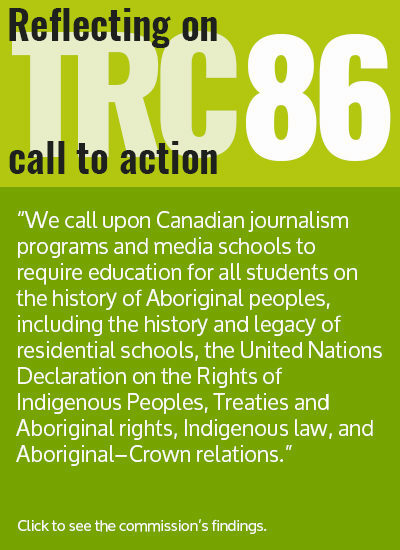 86 asks Canadian journalism schools to ensure students are taught “the history of Aboriginal peoples, including the history and legacy of residential schools.” With this essential directive in mind, master’s students at Ryerson School of Journalism embarked on this digital reporting project inspired by the TRC’s calls to action in areas from holistic healthcare to criminal justice, from preserving languages to fostering new generations of athletes. Special thanks to Hannah Clifford and Miles Kenyon, of Journalists for Human Rights, for sharing their organization’s significant expertise in reporting on Indigenous issues, both through their in-class workshop and their tireless assistance throughout the process. For more information on Aboriginal resources at the university, please visit Resources at Ryerson.